When a brand like Mortgage Tree runs a contest and they utilize an Artist that is NOT AUTISTIC for a campaign, red flags are raised immediately. There are SO MANY THINGS WRONG WITH THIS. Can you spot them all? A contest is being run and prizes are available to those they choose. There’s not many restrictions as to who can enter. When I say this has a lot to do with branding, Crystal Salamon deleted her original case study which revealed that only about $60 has been spent on paid ads when this campaign was run in 2017. That’s right: she’s been at it for years. I have posted negative reviews on both Crystal’s facebook page and Mortgage Tree as well. With Mortgage tree, that lead to a very uncomfortable conversation through private messages which I try to avoid. Of course, there’s plenty more links that include all the twitter and instagram pages as well as a search for their hashtags. They’ve got all their bases covered. The youtube videos are pretty bad too. There’s mortgage companies running contests complete with puzzle pieces and artwork done by a non-autistic person. It’s also the time of the year that my local car dealership puts up some heinous banner on the inside and outside of their building. There’s also pretty crude donors, ignorant ambassadors, poorly thought out sponsorships and William Shatner’s gaslighting of Autistics on Twitter amongst all the things we already have to deal with. 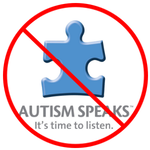 Why are so many people bashing the charity Autism Speaks during Autism Awareness Month? for the Made By Autistics Community! I am starting a website and may buy a domain name soon (if I can afford it!). I would love to feature more people. Join us on Facebook. The community page will have more information on how to submit. After being beaten down this week (see my last two posts) and feeling absolutely hellish, I wanted to do something good, something creative and something NICE! I have found there to be a severe lack of opportunity for my Art locally and I can only imagine that other people have felt the same so I created the Made By Autistics Marketplace on facebook to give people the chance to sell their art, wares and other things they’ve created to anybody willing to join the group. I coined the phrase “By Autistic People For Everyone” to really outline what i’m going for. Time for me to boycott. If I say I don’t want to be on the phone then please respect me. I have been dealing with some of the worst customer service I think i’ve ever experienced in my life. I visited a popular shoe store that is geared towards youth with popular brands like Vans and Converse, to name a few. It takes a lot out of me, energy-wise to even get out of bed, get ready, and leave the house. I decided to go to the mall – which I rarely do and it was a huge mistake. I walked in to this store, the teenage sales associates were standing around, three of them, conversing. I actually had to interrupt their conversation to ask a question. No one wants to have to do that. It also was a Sunday and I was the only customer in the store. The last time I went to this mall and walked by this store, their sales associate was sitting on the cash table, legs dangling down towards the entrance. This should have been a red flag, but it wasn’t. I wrote both their social media and their email and received form email responses. Nothing says “I don’t care about your patronage” by copying and pasting a pretty generic message – especially after spending the time to actually file a complaint and give them room to rectify the issue. From what i’ve read, it seems like their customer service, generally speaking, is pretty awful. There was a few other issues, but i’ll spare you the details. Her: Hi this is __ at Journeys , who am I speaking to? Me: Yes. I don’t feel comfortable on the phone, can you email me? Me: I’m on the Autism Spectrum, i’m really not comfortable on the phone, can you email me? I’ve also read cases of racial profiling, emails being ignored, product fulfillment gone wrong and a lot of customers vowing to never shop there again. Celebrities – you know them. They can be kind, generous, and approachable. They can also be crude, negative and bigheaded. In this case, the latter applies. Yesterday was an absolute firestorm on twitter and it all started with a joke: Someone posed the question of what they should wear when going to meet William Shatner. Someone else responded by saying “A Boycott Autism Speaks Shirt!”. William personally found this tweet and followed it up with the tweet you see here. Victoria responded and Shatner viewed that as a threat – which is completely ironic due to the statement he made in the above tweet. It also appears that this is not the first time he has become very hostile towards someone who was asking a very genuine question about their Autistic child. I wonder where his publicist is and how his unprofessional behaviour has not reached the mainstream media. If you are going to attack a marginalized group of people, defend Autism Speaks and expect that the #ActuallyAutistic community is going to be quiet, you’ve got another thing coming. A lot of his fans are blindly following him and hanging on to his every word, without doing research on the subject. They are attacking us and creating an extremely stressful environment because of their perceived allyship to Mr. Shatner. I would only hope that asking for donations to ASAN would be welcomed, but sadly that is just not the case. I added to my anxiety today and it was my own fault. At this moment I am waiting for a bus and the sun is beaming down on the back of my legs. This long awaited warmth is not eclipsing my overwhelming feel of regret and embarrassment. I learned a very big lesson today: I don’t ever have to apologize for offending people in regard to my strong, personal beliefs.